These 365 daily readings reveal the ever changing testament to the imagination and creativity of our God. His mighty hand crafted the tallest mountain and the most delicate snowflake. More than thirty writers share their observations and reflections of God's goodness in the beauty and wonder of nature. Let the Earth Rejoice equips readers each day to know that the same God who created the ocean and cares for the hummingbird, also created and cares for you. 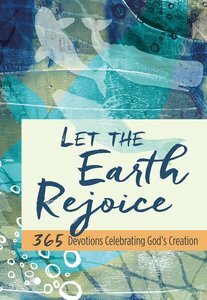 About "Let the Earth Rejoice: 365 Devotions Celebrating God's Creation"